So I have an interesting story. A couple weeks ago, I went to Rockaway Beach with my friends to celebrate my good friend Cassidy’s 28th birthday. We drank micheladas, basked in the sun and ended up back in Brooklyn for a little surprise par-tay. 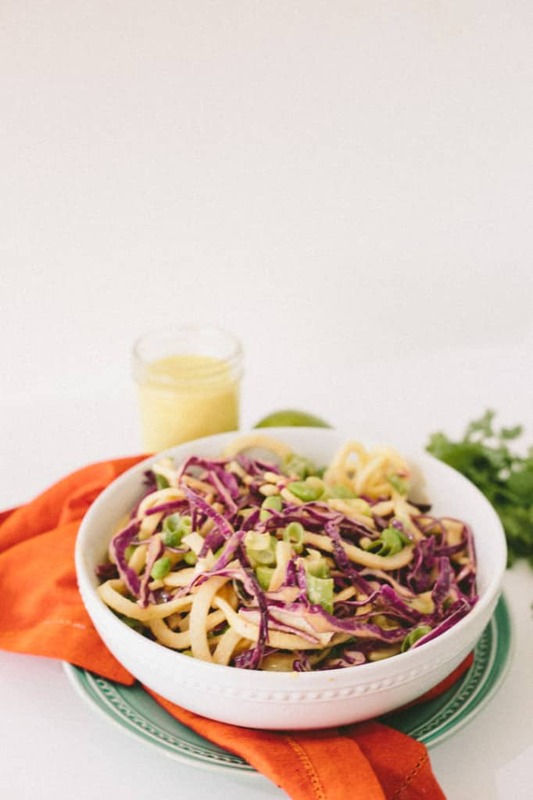 Before I tell you the story, I just want to tell you that this mango-almond jicama and cabbage salad is a great for a no-cook summer. It’s packed with color, freshness and healthy nutrients. It saves well in the refrigerator and goes well with any type of protein – quinoa, chicken or heck, even pork chops! 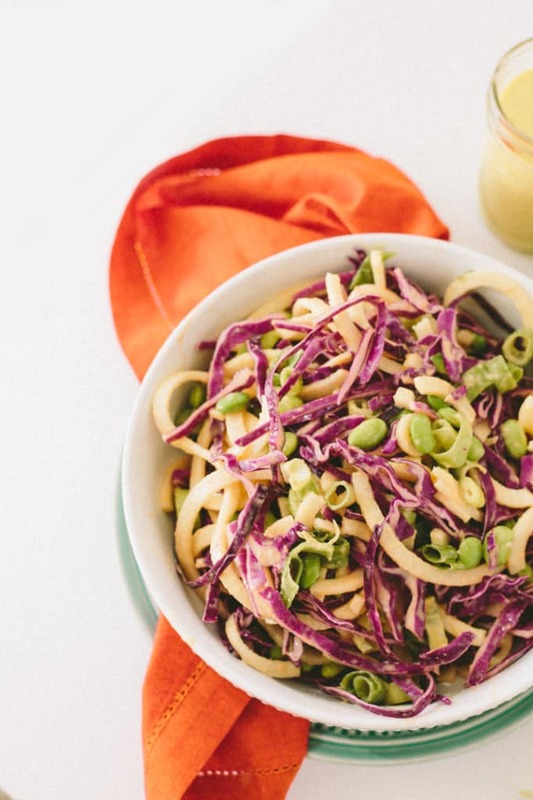 One note about this recipe is that the dressing is a bit sweet (on account of the mango), so if you’re looking to make it less sweet, use a little less mango and add in half an avocado. Back to the story. Rockaway Beach is great – it’s a closer, more hip alternative to the Jersey shore. It’s a little grittier, but in a very cool, real way. 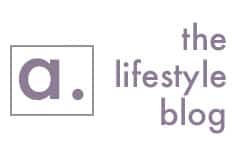 I really recommend visiting if you live in the NYC area! As we go to leave the beach, I see a girl, standing in front of this cute lime green brick building. As I come closer, I see she’s holding a ice cream cone with rainbow sprinkles. Mm, I think, where can we find that? As I get closer, I see she’s posing in front of a guy, who is taking pictures of her. She tilts her head back, smirks and giggles, although I didn’t hear him say a word. I sound like I’m writing a column in Cosmo, but I promise there’s a point! I stopped and a few feet behind him, waiting for my friends, I realized what they were doing – staging an Instagram picture. The girl goes, “Okay, one more!” and she sticks her tongue out, barely gracing the top of the swirly ice cream. The ice cream wasn’t even hers, people!! It was just for Instagram! I just thought that was a funny story. Place all of the ingredients for the dressing into a blender and blend until smooth. Taste and adjust, if necessary. 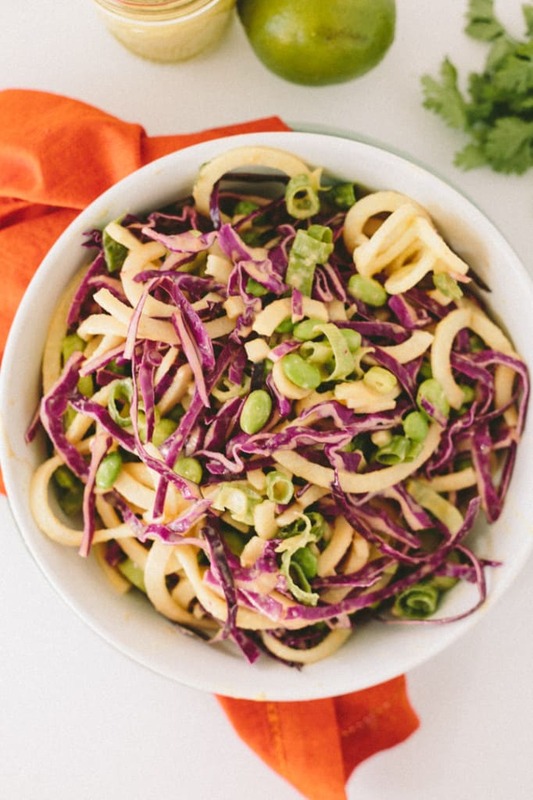 Combine the jicama noodles, scallions, edamame and spiralized cabbage into a large mixing bowl and toss to combine. Drizzle with the dressing, toss again and set aside in the refrigerator. Let chill for 10 minutes, then toss together and plate. 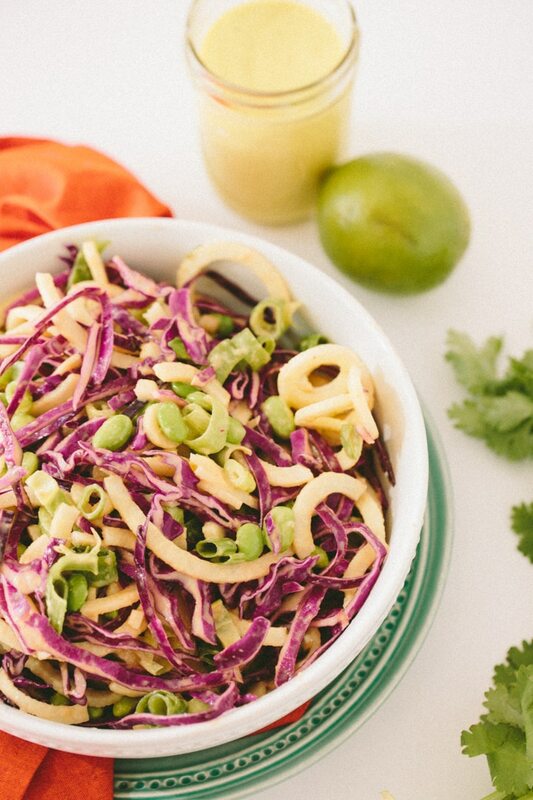 Garnish each bowl with avocado. I have yet to sprilize cabbage or jicama. I may start with this recipe :). I'm amused with this story, an ice cream cone used as a prop. I would be eating that- did you find out where to get one for yourself? :; Thank You for another great recipe. Have a great week! I worry that we spend more time documenting our lives than living then. I love a good blog, but the obsession with selfies I find sad as well. Who are they trying to convince that they have great fun? Themselves? Because most people don't really care about photos they aren't in unless they are truly interesting photos. Just my 2 cents. 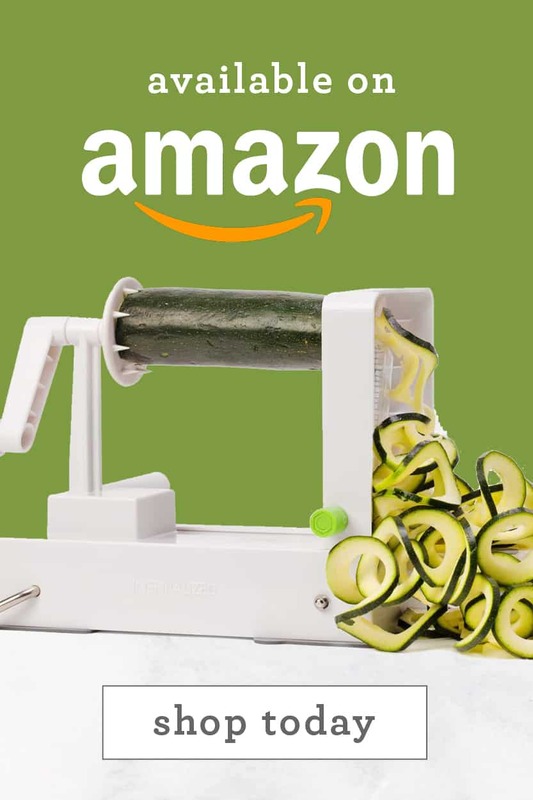 I'd say for optimal freshness, 2-3 days! Who knows who she was or why she was taking the photo. Its funny i agree but most of us have done something like that before. I almost never post photos on Facebook or instagram because I want to avoid being the type of person who relies on likes to make myself feel good and let's be honest it does sometimes feel good. We want to show others how amazing our life is even if it is or isn't. I see the staged photo, too many selfies, too many pictures of kids, trying to slip an engagement ring in every shot, posts saying how amazing your bf/husband is etc. as a cover up for insecurities. It is SO obvious to me when people do this. It doesn't make me think bad of them it more makes me think they have issues haha. Since I deleted most of my not real friends from social media and became aware of how I was trying to "brag" about my life by posting certain things without realizing it, I have become much happier. I know I have an amazing life and I don't feel the need to tell everyone about it. Makes it seem more real ya know. Tonight we were planning to have our kids/grandkids over, and this morning as I was going out the door to groc shop for a few "go-withs", this recipe came in, so I decided "why not have the kids be guinea pigs again?" I picked up the stuff I needed for it and it was delicious! 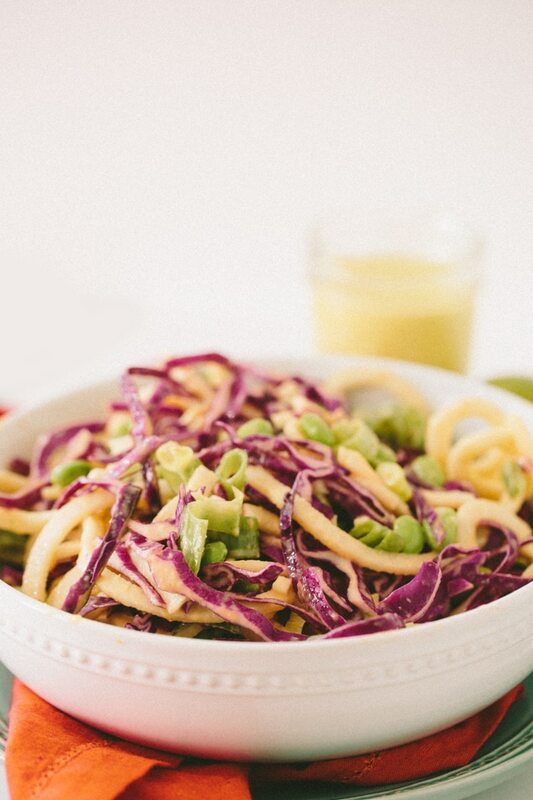 Usually I put jicama on a relish tray next to dip or hummus, but this was the first time I used it in a spiralized dish - added a real nice, fresh crunch! The mango dressing actually made the jicama taste like apples or pears... BTW#1, a bag of frozen mango cubes was exactly 1-1/2 cups, and the dressing was the perfect amount for the salad (I didn't use the almond milk - the dressing was the right consistency without it). BTW#2, it took less than 1/2 of a red cabbage to make a cup. 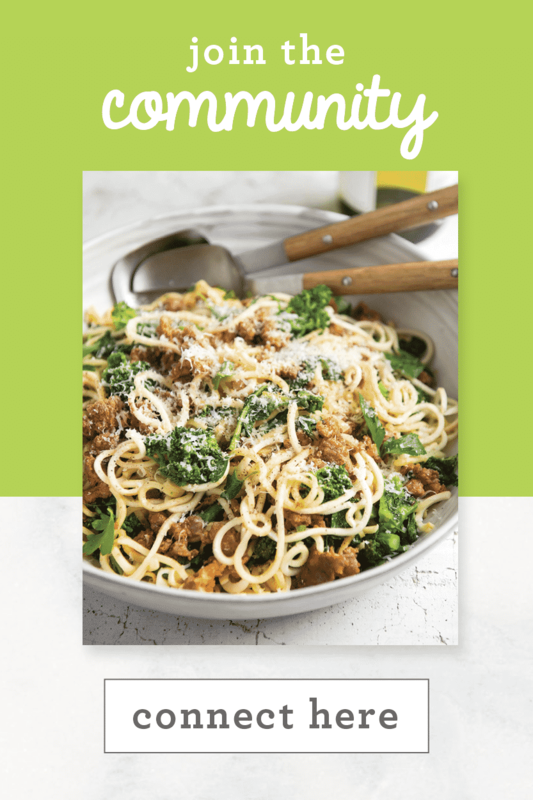 I spiralized the whole thing as long as the spiralizer was out, and put the left-overs in a lg baggie to be used in something else tomorrow (?). . BTW#3, getting the edamame out of the pods was pretty time-consuming, so I made a note on the printed recipe to do that a day ahead next time and I'll just store them in a covered bowl or plastic bag. Thanks for another winner! I know this is an old posting, but I am making this for dinner tonight, and I was able to find cooked, shelled, frozen edamane at Trader Joes. Just a heads up for anyone wanting to make this simple! 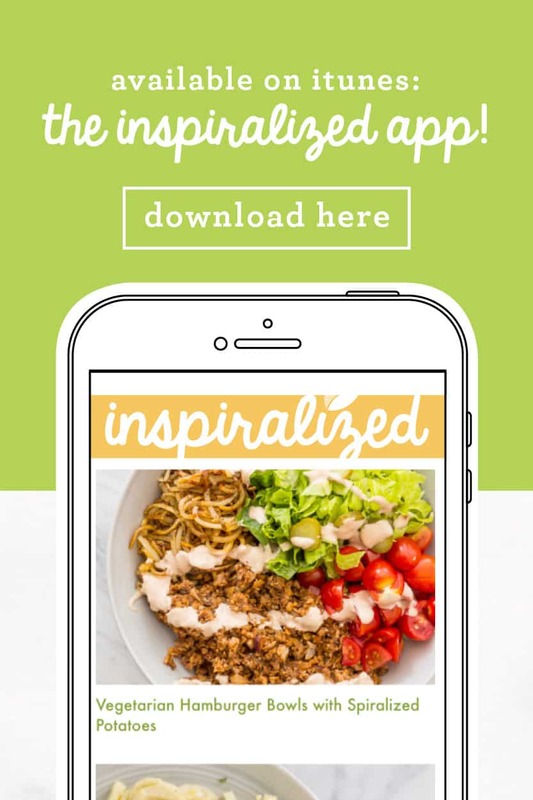 Love your app! 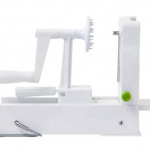 Just got my daughter and son-in-law Paderno spiralizer. They also just got your app. 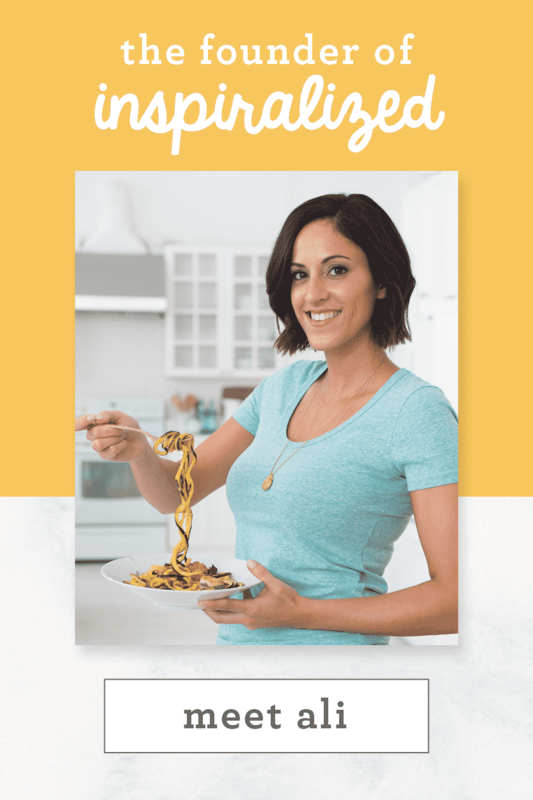 We both have the 4 blade spiralizer. 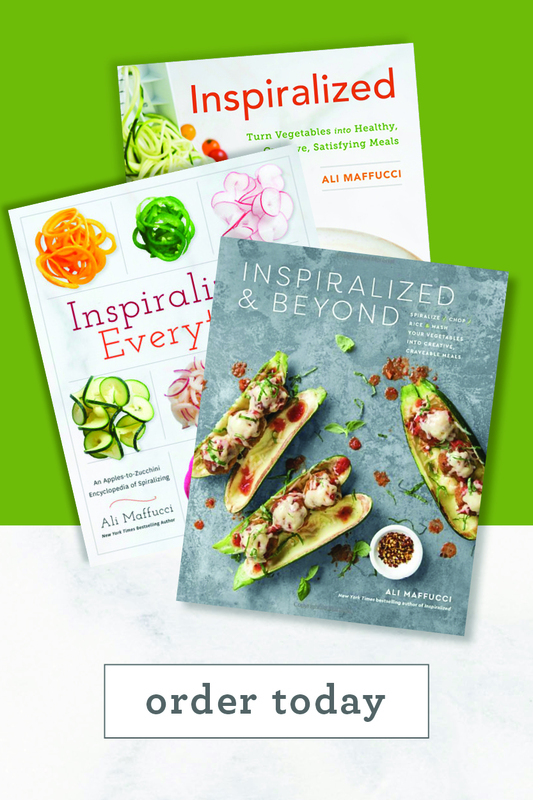 Can you help us with figuring out the conversions for the 3 blade to 4 blade for you recipes? We get confused on which blades to use due to having the 4 blade!! Thanks!!! what is jicama? I am in Canada and never heard of it. I received a spirailzer for Christmas and discovered your site after i received it. 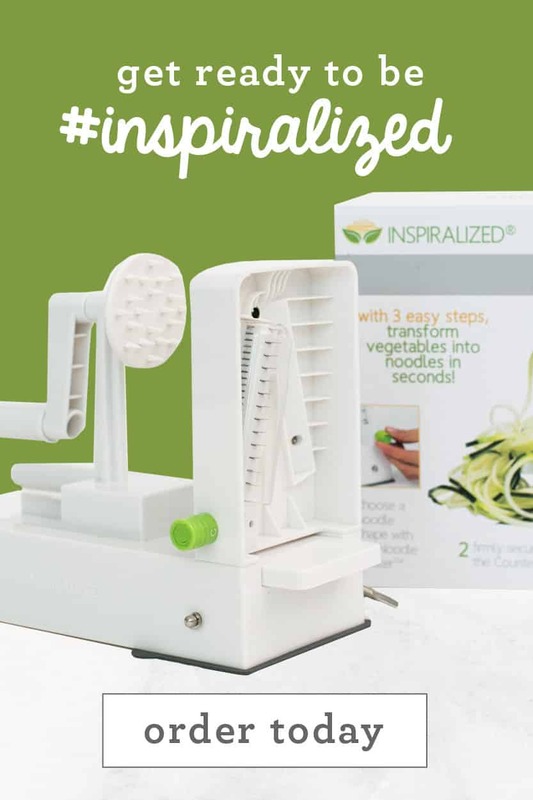 I have been wanting an inspiralizer ever since but couldn't justify buying another one when mine was so new. Well today i made this salad for a work potluck and one of my co workers said she has been wanting to start spirilizing veggies, so i offered to sell her mine so she could try it out and just place my inspirilizer order!!! i'm so excited!! I was going to get it through amazon prime so i could have it this weekend but your tote bag sold me on getting it here. I'm a sucker for a good tote. HAHAAHA P.S we all love the salad!! The dressing is SOOOOO good!!! !